This is another in the series of "Design Follies". To read my earlier post on the topic. Click here. Design follies take different routes. Not all of them are designed to be silly from the start. 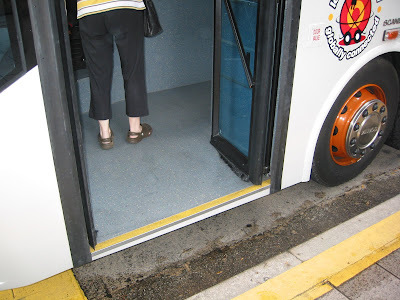 Sometimes they started out as being useful design, like this entrance to the bus, which has done away with steps and is so low that a wheelchair can go up easily. This one I managed to capture, is a city sight tour bus for tourists. 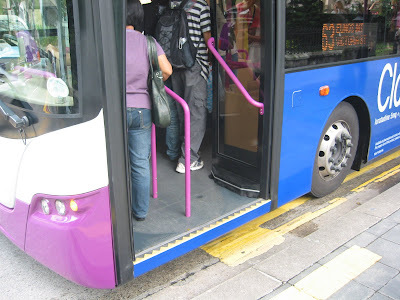 However, I think the design merits must have not been communicated widely enough to bus companies, as when it comes to using them for public buses, they put a barrier up!!! 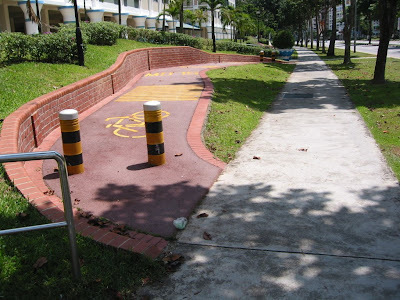 Why do they need the handrail in the middle obstructing the access of wheelchairs and prams? 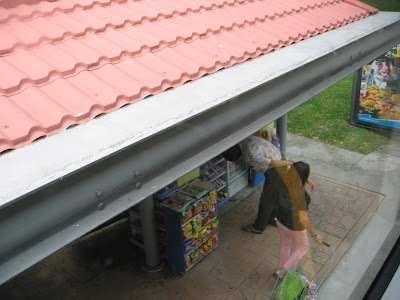 This is the rooftop of a bus stop. The part I am focusing on is at the end of the red tiles where the gutter used to be. It is now filled up with concrete. The gutter drain used to be there to direct the rain water orderly down to the ground. That was a very appropriate design, such that rain water won't be dripping all over the place when it rains. These government apartments in Singapore were built ten years ago. 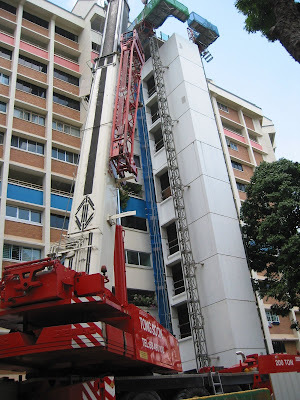 At that time, they built the flats with elevators going to every alternate floor. Sometimes, in between two floors. However, as the population ages, the government realised that there will be more old weary legs that can't take them even one flight of stairs, not to mention the occurences of more wheelchairs in the near future. They now realised that they need the elevator to stop at every floor. That was a "pennywise pound foolish" design savings. In order to save a bit of money, now they have to spend a lot. However, don't expect the government to own up to this folly. When it comes to politicians, trust them to package something to their advantage when they need to. This correction is now sold to the people as "upgrading". 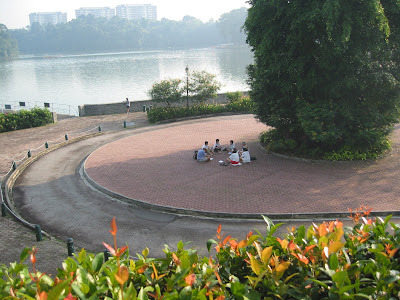 That is, upgrading of the value of their property and enhancements of their assets. The majority of the people were sold. As if this is not enough, if you are in the Opposition constituencies, you will not be privileged enough to enjoy the benefits of the upgrading. "No upgrading for you because you did not vote for me." Now they are even using their design folly as a weapon against the Opposition, knowing that there are also old people living there on the receiving end of their design folly. 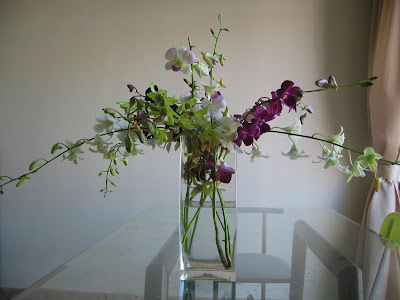 This is an elegant glass vase of contemporary design. Good to look at but difficult to carry around. I broke the previous one, when washing them with detergent. It slipped off my hands and slammed itself on the sink, breaking into bits. 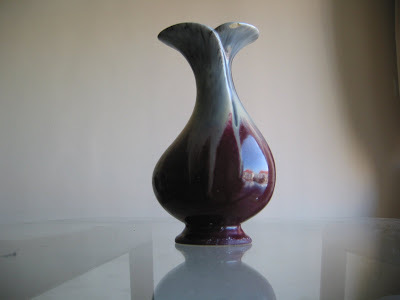 That is the reason why old style vases always have a 'neck'. The 'neck' is there for a reason - to hold. But as it has always been there, we gradually take them for granted and design something more modern, arguably better to look at, but difficult to handle. Does that sound familiar? This one is familiar. 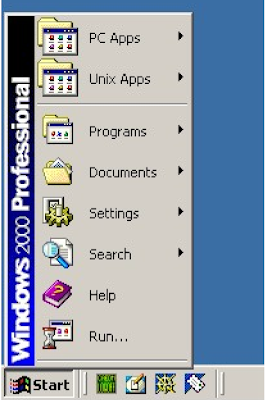 To end your Windows session, you click the "Start" button. Steve Balmer's (Microsoft's CEO) mother picked this design flaw out. She picked a flaw many of Microsoft designers somehow missed! 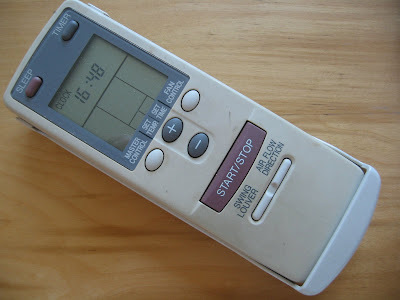 Probably equally familiar is this humble air-con remote control. It has the start and stop controls on the same button. As a result, it is difficult to know whether the air-con is on or off sometimes. Occassionally, after coming home from work, you would realised that you have unwittingly left it on the whole day.